The Oklahoma City Thunder were probably the biggest surprise in the entire NBA last season as they went from winning 23 games in 2008-2009 to a record of 50-32 last year. It wasn’t a surprise that this team got better, but the pace at which they improved shocked just about everyone. It all starts and ends with Kevin Durant, who is quickly becoming one of the best players in the NBA. The Thunder gave the Lakers all they could handle in their first round playoff series. It was no fluke that this team won 50 games last year. A team with as much young talent as Oklahoma City should be considered a real threat no matter which conference they play in. The Thunder didn’t make a lot of moves in the offseason, but the best move they made was extending Durant’s contract. When you find a superstar like Durant, who is capable of leading the team to much bigger things, you absolutely must keep him around for a long time. Cole Aldrich was the top draft choice of the Thunder, and I believe he will develop into a solid force down low over the course of the next few years. It might not happen right away, but I expect Aldrich to contribute to this team immediately. If you take a look at the young talent on this Oklahoma City roster, you will realize why so many people love their chances to continue to improve. Remember, Kevin Durant will have just turned 22 years old when the NBA season starts this year. Russell Westbrook, Jeff Green, Serge Ibaka and James Harden are all 24 years of age or younger. You know every NBA General Manager would love to have four terrific young talents like that, and that’s without even mentioning the star of the team: Durant. Thabo Sefolosha may not help out much on offense, but his defensive intensity is vital to this team’s success. The one thing this team may be missing at this point is a strong rebounder down low, but Aldrich should help fill that role before long. The outlook is as bright for the Oklahoma City Thunder as it is for any franchise in the NBA. The Oklahoma City Thunder schedule has been released, and there are several very interesting matchups you’ll want to watch. The Thunder open the season at home against the Chicago Bulls on ESPN on Oct. 27. On Christmas Day, the Thunder will host the Denver Nuggets in a crucial Northwest Division matchup. How about the last few games of the season? The Thunder will play at Los Angeles against the Lakers on April 10. Expect that matchup to weigh heavily on the Western Conference playoff standings. The Oklahoma City futures odds are definitely reflecting the fact that this team should be even better in 2010-11. The Thunder are listed as the sixth favorite in the NBA to win the NBA Championship at +1750. Oklahoma City is currently listed at +600 to win the Western Conference. If you are interested in betting on the NBA MVP in 2010-2011, 5dimes currently lists Kevin Durant as the favorite to win the award at +240. Oklahoma City will have to deal with three other very good teams in the Northwest Division this year. Even though they play in such a tough division, I see this team as a serious contender this year. They should improve on their win total from last year, and I am quite sure they’ll be better than a No. 8 seed in the Western Conference playoffs. I think this team will win at least 53 games this year. 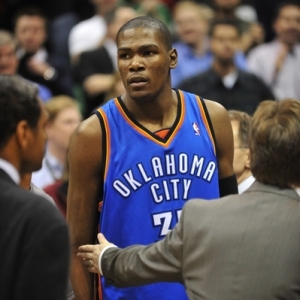 Should you bet on Oklahoma City to win the NBA title or even the Western Conference title? I think it is very unlikely this team can win it all just yet, but a Western Conference title isn’t out of the question. This is a team that has a very bright future! Doc’s Sports is very excited about another profitable NBA picks season. Picks will be available starting Tuesday, Oct. 27. Doc’s Sports has become known as one of the best NBA handicapper in the nation with three of four winning seasons - $100 bettors are up $18K in the last four years! Early Bird specials will be posted soon, so check our homepage regularly. Also, check our home page daily updated NBA odds, NBA betting articles and daily matchup reports.